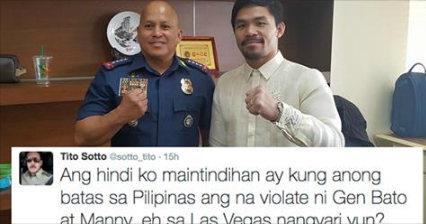 According to Senator Tito Sotto, the controversial trip of Philippine National Police Chief Director General Ronald “Bato” Dela Rosa and Senator Manny Pacquiao didn’t violate the law in the Philippines because he was already in Las Vegas when Senator Pacquiao treats the PNP Chief. “Ang hindi ko maintindihan ay kung anong batas sa Pilipinas ang na violate ni Gen Bato at Manny, eh sa Las Vegas nangyari yun?” Senator Sotto said. “Sa Las Vegas nangyari, therefore, not within the jurisdiction of the Philippines. What do u think @teddyboylocsin ?” Sotto wrote in his tweet. Senator Sotto said the Pacquiao shouldered the expenses of Dela Rosa in during his fight in Las Vegas and not in the Philippines.